Discussion in 'Acquistion Targets' started by Exiga, Oct 10, 2011. Unlike my close friend who was crazy over Wilmar, this is one of the prolong longterm downtrend stocks which I never liked based on both FA and TA. 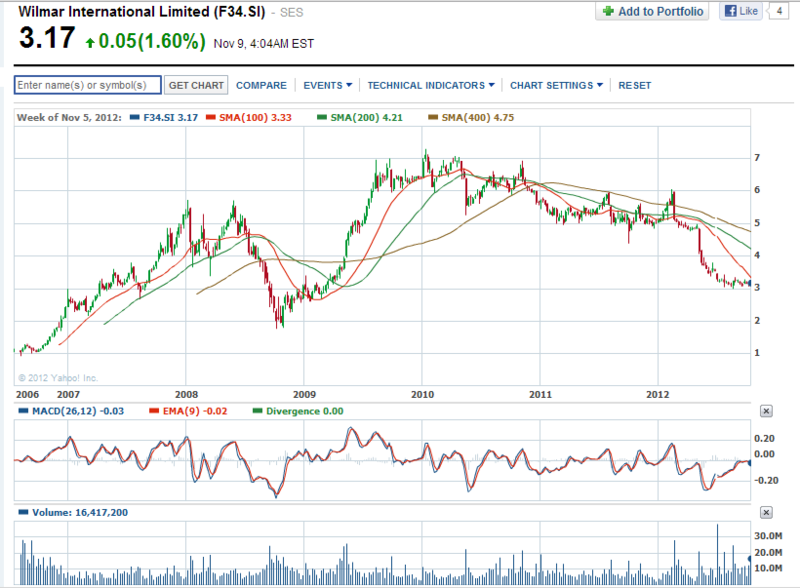 Wilmar hit high of S$7.23 in Nov 2010. Once the long-term horizontal support @ S$3.00 is broken convincingly, Wilmar is an outright SELL. Wilmar is a strong downtrend stock; it has a stair-step decline chart pattern. Wilmar used to b wad price too...? Wilmar closed with a spinning top @ 3.17 (+0.05, +1.6%) on 9 Nov 2012. Cargill, Wilmar and Bunge, three leading commodities trading houses, have taken delivery of the biggest amount of sugar on record from the main futures exchange for the sweetener. The record delivery of 1.4m tonnes of sugar – almost equal to the annual consumption of Malaysia, one of the world’s top 10 sugar importers – comes as the trading industry attempts to balance growing supplies from Brazil with strong demand in Asia and the Middle East. The previous delivery record was set at 1.3m tonnes of sugar in 2009. “The largest delivery in the history of the exchange coincides with a record Brazilian crop,” said Michael McDougall of commodities brokers Newedge in New York. Commodities trading houses usually deal the sweetener in private, but the futures exchange is increasingly becoming a key channel for trading physical sugar. The companies taking delivery held their long futures positions until the expiry of the contracts, hence accepting physical sugar. The companies delivering against the ICE May sugar contract, Noble Group, Louis Dreyfus Commodities and Sucres & Denrées held short positions until expiry, according to brokers. “The market has been surprised how much sugar was delivered,” said Jonathan Kingsman of sugar consultancy Kingsman in Lausanne. According to the IntercontinentalExchange, home of the raw sugar benchmark, 28,210 lots or 1.4m tonnes of the sweetener was delivered against the May contract. The number was the highest since records started in 1989 and beat the figure seen in 2009, where 26,783 lots, or 1.3m tonnes were delivered against the July contract. The delivery comes as demand in Asia remains strong and as record crops in Brazil have depressed prices. With the ICE July benchmark trading at 17.35 cents a pound, receivers of the physical delivery were betting on demand from Asia and the Middle East remaining firm. Analysts said that China was expected to continue to take advantage of the low prices to build up its strategic reserves while speculation that Indonesia, one of the world’s leading importers of sugar, was raising its import tariffs for the sweetener in July also spurred long positions. However, the high level of supplies matching demand, contrary to earlier expectations, was a bearish sign, said traders. Availability of Brazilian sugar was not expected to be high despite the bumper harvest due to bad weather earlier in the month, which delayed the harvest and the crushing, as well as congestion in the ports. Traders said the May delivery pointed to larger supplies for later in the year. I agree with nottibird's analysis on Wilmar & SembMar as both stocks have weakened with prices trading at LH & LL, i.e. SHORT is preferred than LONG. For these 2 stocks, counter trend has higher risks hence a tight stop-loss is important and necessary. On 10 Apr & 16 Apr 2013, I posted that SMM could have a possible technical rebound/short-term trend reversal. Had SembMar spiked and hit 4.38 and/or closed above 4.38 to 4.41 with high volume on 17 Apr, a long white marubozu would have formed a bullish morning star pattern confirming a potential short-term trend reversal/dead cat bounce. However, the EOD closing on 17 Apr had formed a bearish harami instead of a bullish morning star confirming that the strong pro-longed bearish downtrend prevails. SembMar closed with a spinning top @ 4.25 (+0.03, +0.7%) on 19 Apr 2013. Immediate resistance 4.30, iImmediate support @ 4.20. Wilmar closed with a spinning top @ 3.34 (+0.06, +1.8%) on 19 Apr 2013. Immediate resistance @ 3.35 immediate support @ 3.27, next support @ 3.20, strong support @ 3.00. SembMar closed with a spinning top @ 4.30 (-0.02, -0.5%) on 16 Apr 2013. Immediate resistance 4.38, immediate support 4.24. AGM on Fri 19 Apr 2013. SembMar closed with a bullish harami @ 4.32 (+0.03, +0.7%) on 10 Apr 2013. Immediate resistance 4.30, immediate support 4.21, next support 4.13. SembMar broke the major support @ 4.41 with prices trading at LH & LL. Lookout for +ve signals (a long white marubozu with exceptional high vol. + confirmation) to buy for a technical rebound/short-term trend reversal. If SMM's EOD closing today is a long white marubozu, it's a confirmation of a bullish morning star pattern; an unconfirmed chart pattern has no further meaning. She is the wife of Fred Flintstone. She has been doing a Lower High Lower Low price pattern. This is her range for the last 4 weeks. 25th to 28th Mar - $3.43 to $3.55. 1st to 5th Apr - $3.37 to $3.52. 8th to 12th Apr - $3.28 to $3.37. 15th to 19th Apr - $3.25 to $3.37. She closed at $3.34 on Fri...UP 6 cts from the previous session. On the face of it, closing UP 6 cts may seem positive. profits to close their trades ahead of the weekend. Chart-wise, her price appears to be resisted by her 20-dma. Most of the time, she is trading below her 20-dma. light at the end of the tunnel will show up anytime soon. 1. I will see if it has the muscular contraction to pump itself higher than $3.34. advancing army but due to a handful of commandos carrying out a covert mission. I am stuck, I will cut. If I am sidelined and I want to play, I will short. as the stock is still falling, they will let it fall. And wait till Friday to cash out. and resisted by her 20-dma which again serves as a coffin lid. Then I saw something right at the bottom which caught my attention..................a hammer!!! She closed at $4.25 on Fri. Her range on Fri was $4.21 to $4.27. Her range for the week was $4.20 to $4.38. Let's see if that hammer can hammer her out from the doldrums into higher up. But dont expect much. Her resistance is the 20-dma at $4.35. After that is last week's high at $4.38. Wilmar closed with a black marubozu @ 3.28 (-0.02, -0.6%) on 18 Apr 2013. Immediate resistance @ 3.35 immediate support @ 3.27, strong support @ 3.21. SINGAPORE - The Monetary Authority of Singapore (MAS) has taken civil penalty enforcement action against Mr Ang Kok Min for insider trading under Section 219(2)(a) of the Securities and Futures Act (SFA). On August 13, 2010, Wilmar International Limited (Wilmar) announced its intention to purchase 20 per cent of the share capital of Kencana Agri Limited (Kencana), a company listed on the Singapore Exchange Securities Trading Ltd (SGX-ST), at $0.35 per share. After the release of the announcement, Kencana's share price closed at $0.385, a 10 percentage increase over the preceding day's closing price of $0.35. Before the announcement, Mr Ang, a senior trading manager at Wilmar at that time, had attended a meeting during which it was agreed that the investment by Wilmar into Kencana would be at an indicative price of $0.35 per Kencana share. Whilst in possession of the non-public price-sensitive information concerning Wilmar's intention to invest in Kencana, Mr Ang bought 50,000 Kencana shares on July 23, 2010, and another 50,000 Kencana shares on August 2, 2010. As a result of his purchases, Mr Ang made a profit of approximately $6,200. Mr Ang has admitted to contravening Section 219(2)(a) of the SFA and has paid MAS a civil penalty of $50,000, without any court action. The matter was referred to MAS by SGX-ST.
Wilmar closed with a black marubozu @ 3.30 (-0.13, -3.8%) on 11 Mar 2013. Immediate resistance @ 3.40 immediate support 3.30, strong support @ 3.27. [Trading Central] Wilmar International: turning down. Update on supports and resistances. Our preference: Short positions below 3.75 with targets @ 3.2 & 3 in extension. Alternative scenario: Above 3.75 look for further upside with 3.9 & 4.1 as targets. of the H7N9 virus which had caused six deaths last week. turn, crush margins in China. (WACC 6.6%, ERP 8.7%, Beta 1.1, TG 3%). Singapore-based plantation company Wilmar International said the withdrawal of investments from the world’s largest sovereign fund is “surprising” considering its ongoing efforts on sustainability. “The Norwegian Government Pension Fund’s decision to withdraw investments from the palm oil companies is regrettable and surprising, especially so because a number of these companies (which the fund withdrew from) are active members of the Roundtable on Sustainable Palm Oil (RSPO) including Wilmar,” it said. In an email to KiniBiz, Wilmar said it remains committed to sustainable development as “it is the only way to ensuring long-term viability of our business”. Instead of destroying forests, Wilmar said it only operates on land made up of degraded and logged-over secondary forests which have “lost their economic and environmental values”. “Converting these unproductive wastelands into productive plantations can help restore these values through implementation of the RSPO principles and criteria…which includes delineation and protection of High Conservation Value (HCV) areas,” it said. The company, which came last in Newsweek’s environmental ranking of 500 companies worldwide, added that half of its plantations are certified by RSPO. “Further to RSPO standards, we adhere to policies on no-burn practice and no development on peat-land, regardless of depth,” it said. Norway’s US$ 710 billion fund reported in its 2012 annual report that it pulled out of 23 Asian palm oil companies because their “long-term business model was deemed unsustainable”. The fund reportedly sold stakes from firms including Wilmar, Kuala Lumpur Kepong and Golden Agri-Resources. This follows the broadening of focus areas to include deforestation and climate change in its guidelines, which has been lauded by the RSPO. The fund said its pullout came following reviews which included contacting the companies for information, and weighing their commitment to the RSPO. concerns over possible monetary tightening to keep a lid on inflation. in a narrow 201-212 point range since Nov.
the company’s expansion in Africa and potentially Myanmar. Following on an earlier discussion dated 19 Feb 2013, we discussed that Wilmar International is having the possibility of further pullback to 3.350 - 3.400 upon breaking below 3.580 - 3.600. A move below 3.200 suggests that the downward trend may remains intact, while 3.400 is the immediate pivot level to look out for. Wilmar closed at 3.540 on 25 Feb 2013. While it is premature to conclude a cup and handle formation in the making, the probability of testing 3.400 seem possible. The current immediate support is 3.340 - 3.380 (gap support, 2 Jan 2013) and 3.840 - 3.850 (gap resistance, 5 Feb 2013). (1) A move below 3.200 will suggest the possibility of testing 2.300 - 2.410, which may coincide with the Median Line of downtrend Andrew's Pitchfork. A break below the Median Line will suggest further downside. This path may be invalidated when Wilmar breaks above 3.920 and the Upper Bound of downtrend Andrew's Pitchfork. (2) Holding above 3.200, a move below 3.400 to find support at 3.340 - 3.380. A possible rebound back to 3.580 - 3.600 before retesting 3.200. This path may be invalidated when Wilmar breaks above the Upper Bound of downtrend Andrew's Pitchfork and breaks above 3.600. (4) Holding within the Median Line and Upper Bound of downtrend Andrew's Pitchfork will suggest progressing downward in a zig zag pattern. 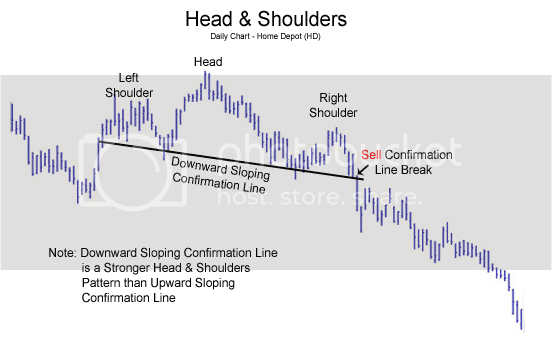 This path may be invalidated upon the break through below the Median Line or above the Upper Bound. On 25 Feb 2013, Wilmar broke the H&S neckline closing @ 3.54. Trade size 50 lots, every trade target profit @ 0.05; continue shorting at lower highs (rebound) when all support levels are taken out convincingly. My sister and myself both got one lot of GLP at IPO 1.96 on Oct 2010, I sold it at 2.15 on the 1st day of listing. Whereas she held onto her one lot and later added 19 lots of GLP bet. 1.80 to 2.00 for long term investment. To date, she holds total 20 lots of GLP avg 1.95 and got her 1st dividend payment not long ago. Lesson learned: Historically, fundamentally strong stock, especially Index stock always have a good chance to bounce back and move up higher. Trendtrader mentioned earlier that NOL was one of his multi-baggers, I believe NOL also stands a chance to bounce back and move up higher. Wilmar is another fallen angle. I believe it could also bounce back and move up higher when times are good. Joie san, bro Jie Lun. I reckon your view that trading intraday OR contra period is like having to fight in a blood pool. As you had mention - win peanuts and lose coconut. Using TA as a guide; everyone has the ability to Train your eyes to earn your profits! Based on H&S breakout; my Wilmar's chart posted on Monday 04-03-2013, 01:11 PM coincided with Trading Central's preference (short; due to the RSI broke below a rising trend line) on Wilmar on Monday 4 Mar 2013 18:42. Wilmar International Ltd. (F34.SG) has taken a majority stake in a palm plantation venture in Indonesia's Papua owned by Noble Group Ltd. (N21.SG), giving the world's biggest palm oil supplier by volume a toehold in the province where it also hopes to grow sugarcane. Wilmar bought a 53.74% stake in a Noble unit that has a majority stake in a company owning 22,953 hectares of land. Wilmar and Noble will form a joint venture to develop palm plantations there, the Singapore-listed commodity suppliers said in a statement Friday. Noble will hold the rest of the equity. Wilmar and Noble didn't share financial details of the deal, but based on industry estimates, developing the land into palm oil plantations would cost between US$125 million to US$150 million spread over a four to five year period. The deal will allow Noble to split the cost of developing the plantation and benefit from Wilmar's palm oil know-how, as it has about 256,000 hectares of plantations in Indonesia, Malaysia and Africa. Wilmar's Indonesian plantations are mainly concentrated in Sumatra and Kalimantan. "Papua is not an easy region, if they can do this they can move on with their plans to develop sugarcane plantations in Papua," said a Singapore-based analyst with a global bank who didn't wish to be named. In 2010, Wilmar said it plans to develop sugarcane plantations and set up mills in Papua in Indonesia's Merauke food estate. The deal will allow Noble to "benefit from that expertise and to jointly build upon the initial platform that we have been developing over the last few years," Yusuf Alireza, a former Goldman Sachs banker who joined Noble as chief executive last year, said in the joint press statement, referring to Noble's palm oil plantation foray. Noble may also be looking to get Wilmar on board as a way to hedge its plantation investment as volatile palm oil prices are being driven by rising inventories and weaker demand. The benchmark Malaysia Derivatives crude palm oil contract has fallen 22% so far this year, with the May contract for delivery at Bursa ending at 2,536 ringgit a metric ton on Thursday. The venture comes at a time of growing environmentalist criticism of the industry over the burning peat forests to expand plantations, which releases massive amounts of carbon dioxide into the atmosphere and which threatens the habitats of wild animals, particularly orangutans, in Borneo and Sumatra. "Habitat conversion from natural forests to oil palm plantations has been shown to have a devastating impact on tropical forests, along with plants and animals that depend on them," according to a statement on the impact of palm plantations on orangutans by the World Wide Fund for Nature, or WWF. The undated statement is posted on WWF's website. Indonesia, which accounts for around 60% of global crude palm oil output, produced about 28 million metric tons last year. Malaysia is the second biggest producer with 18.8 million tons, according to industry estimates. Separately, Wilmar said its net profit in the fourth quarter fell 4.7%, weighed by lower palm oil prices, to 476.8 million Singapore dollars (US$384 million), down from S$500 million recorded in the same period in 2011. The firm's plantations segment profits were down 23% compared to the previous year. Profits in most other segments grew, including an 8% rise in its sugar business. Despite the figures, the company struck an optimistic tone for the years ahead, citing demand for commodities from emerging markets. "Whilst uncertainties in the global economy remain, we are cautiously optimistic of our long term prospects due to good economic growth in our main markets of China, India and Indonesia and the robust business model we have built up over the years," said Wilmar Chairman and CEO Kuok Khoon Hong in the statement. Wilmar closed with a spinning top @ 3.51 (-0.04, -1.1%) on 1 Mar 2013. Immediate resistance @ 3.57, immediate support @ 3.46, next support 3.40, the 200d SMA, strong support @ 3.27. Wilmar closed with an inverted hammer @ 3.43 (-0.04, -1.2%) on 8 Mar 2013. Immediate resistance @ 3.57, immediate support @ 3.40, strong support @ 3.27. In any sector, the fittest survives; long/buy the strongest stock, short/sell the weakest stock. TigerAir closed with a black marubozu 0.69 (-0.025, -3.5%) on 5 Mar 2013. Immediate resistance 0.735, crucial support 0.685. ChinaFish closed unchanged with a dragonfly doji @ 0.575 on 5 Mar 2013. Immediate resistance @ 0.59, immediate support @ 0.555, next support 0.535. Wilmar closed with a bullish harami @ 3.46 (+0.04, +1.2%) on 5 Mar 2013. Immediate resistance @ 3.57, immediate support @ 3.46, next support 3.40, strong support @ 3.27. I have this strong gut feeling that Wilmar is also one of the big short-sellers targets. Wilmar International Ltd. (WIL), the worst performing stock on Singapore’s Straits Times Index in 2012, may extend its slide this year as investors favor agricultural companies that rely less on trading. Wilmar, the world’s largest palm oil processor, lost 33 percent last year, its third annual drop in a row, as profit missed analysts’ estimates in three of the four quarterly reports issued during the year. The company’s stock may fall 6.1 percent, based on the average of 21 analysts’ 12-month target prices compiled by Bloomberg. The company slumped as commodities including palm oil and sugar declined last year. The questioning of Olam (OLAM) International Ltd.’s accounts by short-seller Carson Block’s Muddy Waters LLC made some wary of buying into agricultural companies, even as a growing global population fuels demand for food. Some investors and analysts also highlight that producers engaging in trading activities potentially carry more risk. Wilmar’s slide compares with a 20 percent gain for Singapore’s benchmark index in 2012. Olam, which was targeted by Block in November, lost 27 percent last year, its second straight yearly loss and the second-worst performance on Singapore’s main index. Wilmar and Olam, both based in Singapore, declined to comment on their share price performance. Wilmar gained 0.3 percent to S$3.60 in Singapore today, compared with a 0.2 percent fall in the Straits Times index. Analysts have a 12-month price target of S$3.38 on average. Seven analysts recommend selling Wilmar stock, nine advise buying it and 11 rate it hold. Profit at Wilmar may have shrunk 31 percent to $1.1 billion in the year ended Dec. 31, the lowest since 2007, according to 21 analyst estimates compiled by Bloomberg. The company may post net income of $1.35 billion this year, still 16 percent lower than 2011, according to the average of 21 analyst estimates compiled by Bloomberg. Analysts such as DBS Group Holdings Ltd.’s Ben Santoso still expect a weak contribution from Wilmar’s oilseeds unit this year, which processes soybeans into meal and oil, after it posted losses in the first half of 2012. The loss was partly blamed on bad timing of bean purchases. Margins on processing soybeans, known as crushing, will probably “return back to positive territory but it’s not going to be a major driver,” Santoso said by phone from Singapore. Overcapacity in the industry will continue to affect the unit’s profitability, he said. Olam, the world’s second-largest rice trader, may struggle to shed concerns about its accounts and strategy raised by Block and his research firm Muddy Waters. He first questioned Olam’s accounting methods at a London conference on Nov. 19, and later said the company may collapse in a 133-page research report rating it a strong sell. Olam rejected the claims and sued Block and Muddy Waters in Singapore on Nov. 21. The commodity trader said last week it’s in the best financial health since its 2005 initial public offering and is “comfortable” with its debt. “Besides the still gloomy economic outlook, investors’ appetite toward commodities-related players -- especially those with complex business models -- is also likely to remain lukewarm in the wake of the recent saga involving Olam and Muddy Waters,” Carey Wong, a senior analyst at OCBC Investment Research Pte., said in a Dec. 12 report. Wong rates the commodities sector “underweight” and expects Olam to fall to S$1.44, lower than the S$1.68 closing price on Jan. 4. Still, the average 12-month target price of 16 analysts’ estimates compiled by Bloomberg is S$1.83. The stock lost 2.4 percent to S$1.64 in Singapore trading at the close. Olam, which counts Singapore state investment company Temasek Holdings Pte as its second-largest shareholder, has 11 buy ratings, six holds and four sells, according to data compiled by Bloomberg. Temasek raised its stake in Olam to 19 percent last month and will buy any rights not taken up by other investors in the commodity company’s proposed $1.25 billion bond and warrant offering. Demand for agricultural commodities may be supported by a rebound in China, the biggest consumer of soybeans, which is poised to snap a seven-quarter slowdown as growth probably accelerated to 7.8 percent in the three months ended Dec. 31, according to the median of 35 economist estimates compiled by Bloomberg. United Malacca gained 5.4 percent last year and United Plantations advanced 32 percent in Kuala Lumpur trading. Singapore-based Golden Agri-Resources Ltd. (GGR), the world’s second-biggest palm oil producer, declined 9.1 percent last year. That made it the third-worst performer in Singapore, yet it outperformed Wilmar and Olam. The average 12-month target price for Golden Agri- Resources’ stock is 74 Singapore cents, compared with close of 66.5 cents on Jan. 4, based on 19 analysts’ predictions compiled by Bloomberg. The stock dropped 0.8 percent to 66 cents today. Profit at the Singapore-based producer may have plunged to $494.7 million in 2012, the lowest since 2006, according to 17 analyst estimates compiled by Bloomberg. The stock has dropped amid a 23 percent retreat in palm oil, as customers cut orders and inventories piled up. 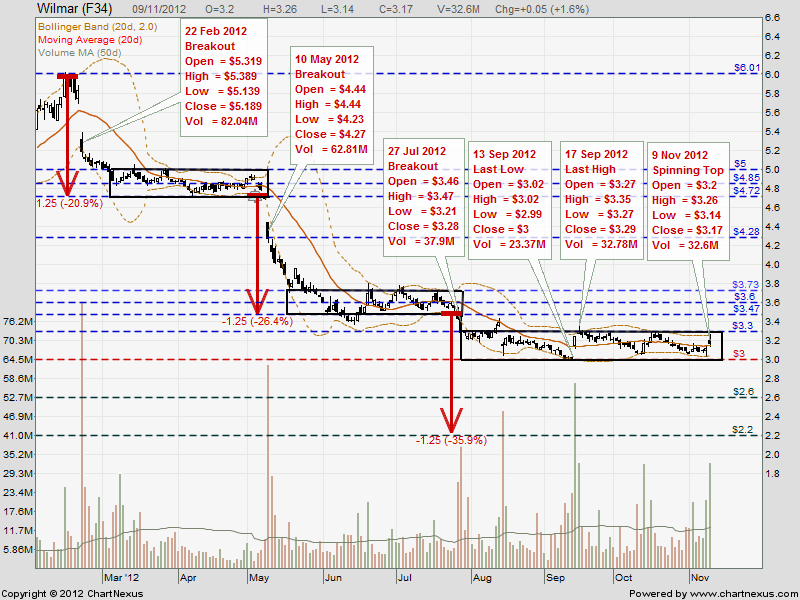 I posted and reminded you not to catch a falling knife/pick bottom on KepCorp, three (3) weeks ago on 30 Oct 2012. Buy at low sell at high or Short at high cover at low. Trade size 10 lots, every trade target profit @ 0.20. 1. On 29 Oct 2012, KepCorp's uptrend was broken, closing @ 10.96. 2. On 2 Nov 2012. KepCorp broke the 200d SMA support @ 10.66. 3. 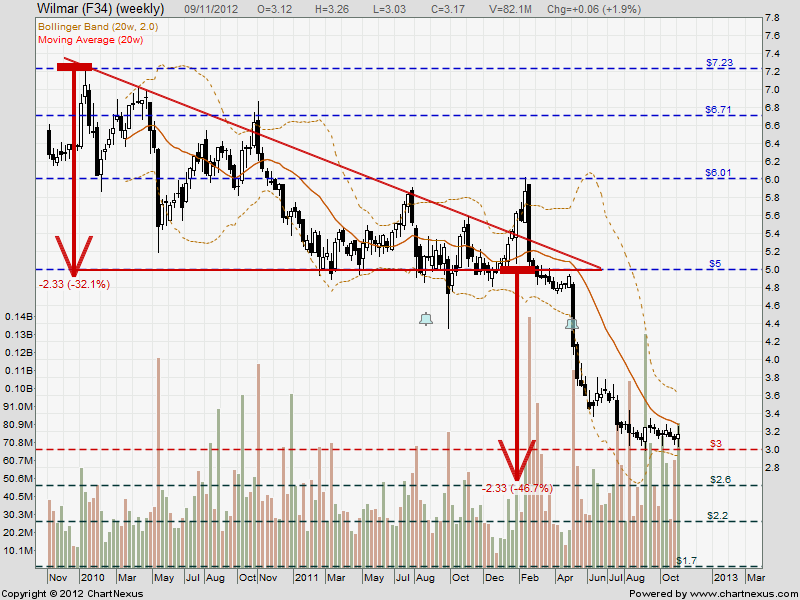 On 6 Nov 2012, KepCorp closed @ 10.50, the 50% FIBO support.